What Is A Daily Spray Cleaner? 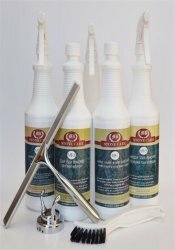 A daily spray cleaner is a safe and effective cleaner for your stone, marble & granite countertop care. It works GREAT on vanities, tops and tables as well as on a plethora of other mediums. It's safe for all Natural Stones. Dissolves oil and grease residues. Removes fingerprints, caked on food, smudges & smears. Safe on food handling surfaces. 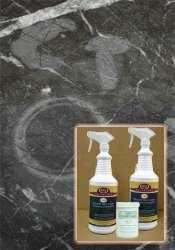 Use it on travertine, granite, marble, limestone, onyx ... all natural stone surfaces. 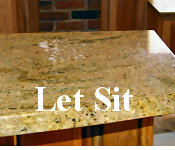 Honed stones, polished, tumbled, flamed, satin, antiqued, brushed... any surface finish. 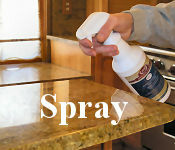 Use it on vertical or horizontal surfaces such as countertops, back splashes, vanities, shower walls, fireplaces, etc. Safely use this stone cleaner on other surfaces such as Corian®, Silestone®, Caesarstone®, Formica®, chrome, mirrors, glass, tiles, stainless steel... even the greasy hood above your stove! As often as needed. 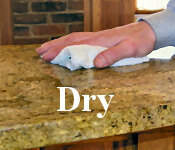 You can use this granite countertop care cleaner one hundred times a day if you want. It's SAFE for stone. Allow the cleaner to sit for about 30 seconds. If necessary, scrub with a sponge or a light duty pad. Buff the surface dry with a clean soft cloth. DON'T use any green or brown scouring pads. The presence of silicon carbide grits in them will scratch even the toughest granite. You can safely use the sponges lined with a silvery net, or other plastic scouring pads. 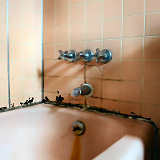 Spray the cleaner and let it sit for a while to moisten and soften the soil before scrubbing. Let the cleaner do the work! 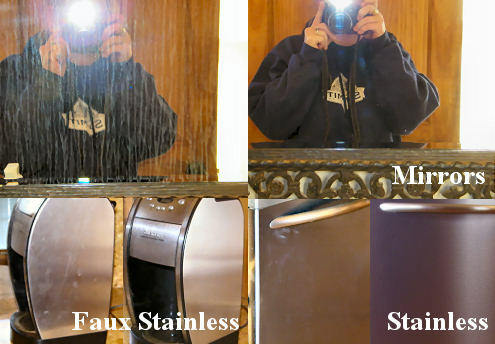 Light duty cleaning such as vanity tops, mirrors or glass? Dilute in a proportion of 1:1 with tap water. This depends on how much stone you are cleaning. It takes me about 5 minutes to clean one hundred square feet of countertops. Yes. It was hard to get a picture of the 'dirt' on these light tops. Wiped the stainless refrigerator with plain water - See how streaky it is? Sprayed on the daily spray cleaner. We used the refrigerator because it's easier to see how well this cleaner performs. There is NO streaking and NO more fingerprints. It's easy to use and took me less than one minute. We tried it on a few different surfaces. One of the best things about this daily spray cleaner: It's made for stone but is effective on so many different surfaces. 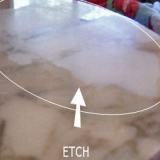 PLUS - it's safe for your daily stone, marble & granite countertop care. I panic when I am running out of the cleaner which keeps my granite clean and shiny!!!!! I ordered a larger amount this time.